Saturday started with an hour-and-a-half drive to Picardy with two of my sisters-in-law and my youngest niece … speaking French. (Michel was with his brother-in-law in another car, so there were no English translations.) We spent the afternoon celebrating the birthday of Michel’s stepfather. It was a beautiful, sunny afternoon fete in the garden of his home, eating and drinking and … speaking French. Then there was the drive back to Paris, this time with my brother-in-law, my eldest niece, and my nephew … speaking French. After that, while Michel and his sister returned the rental car, I hung out at my mother-in-law’s home with the little ones, drawing pictures, eating dinner and … speaking French. And then there was the cruise on the Seine with the whole family, enjoying the sights of Paris by night and … speaking French. The next day, we all reconvened for an afternoon at my father-in-law’s house—another beautiful, sunny day outside in the garden, eating and drinking, playing hide and seek with the kids and … speaking French. I think it was around 7:00 on Sunday evening when I hit the saturation point. After 14 hours on Saturday and 7 hours on Sunday of being “on” in French, I just spaced out. T’es fatigué, Michael ? • Are you tired, Michael? Ouais un peu, mais je suis surtout un peu débordé. J’ai atteint la limite, je pense, et mon cerveau ne fonctionne plus ! • Yeah a little, but mostly, I’m a little overwhelmed. I’ve reached the limit, I think, and my brain isn’t working anymore! 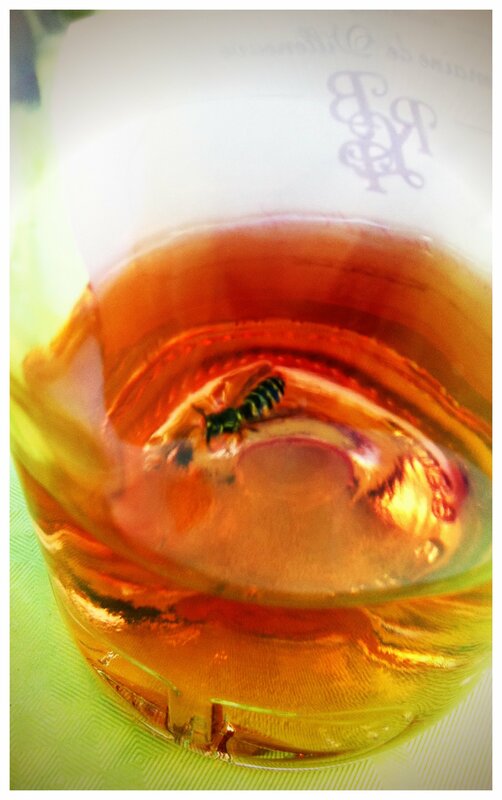 We laughed, and I thought back to a bee that had fallen into a bottle of rosé on our table that afternoon. For fifteen minutes, it had swum in circles, never succumbing but evidently getting drunk on the wine. We had rescued it and laid it on a rose blossom to dry out—literally and figuratively—in the sunshine. A little while later, when we checked on it, it had gone, leaving a tiny drop of water behind on the rose petal where we had left it. Clearly, it had thrown up and flown away with a hangover. Sunday night after getting back to the apartment, I was exhausted. Another episode of True Blood in English with French subtitles for Michel was exactly what I needed to dry out. Ah! American English, and with bad Southern accents! Now, the day after, I think I’m ready to fall into my next bottle of rosé. Love this post ! Good narration and a nice ending, bravo Michael ! Oh my goodness I had a weekend just like that! The husband and I, who are both Americans with southern drawls, went to a French wedding in Boulogne. You are so right–it all becomes like noise and your mind just wanders about. I’m so over the whole you’re going to learn French by being immersed in it…hell…I’m so immersed I’m about to sink! Great post! Thanks Traveling Pear. (I love the name!) I’m glad you enjoyed the post, and I hope you come back from time to time to check out my latest adventures. Now I’m off to check out your blog! I love your blog! I’m about to spend my entire junior year of high school in France, and I’m looking forward to the challenge of (also dreading the idea of, on a bad day) language drunkeness. Thanks for the recap! Thanks! I’m glad you’re enjoying it. Stay posted. Where will you be spending your year? I’ll be living in Rennes, through School Year Abroad. You can follow my experience at eilidhdaily.wordpress.com, if you so wish! Have you been to Rennes? I will check out your blog! As for Rennes, I’ve only been through there on the train on the way to St. Malo. Speaking of … GO TO ST MALO! It is one of the most charming places I’ve ever visited. We went there for my birthday last year. When I finally get around posting about my travels around France, St Malo will be my first post. You’re lucky to be in Brittany. The food is great (even for a vegetarian like me), crêpes, crêpes, and more crêpes, but I’d stay away from the andouille (it’s not like Cajun andouille, trust me!). And eat a kouign amann fresh from the oven. It’s an amazing Breton pastry. Hmmm … another “j’souis gourmand” idea. If we don’t go there as a school, I’ll be sure to put it on my independent travel list! I am definitely looking forward to the good eats – I’ve already warned my family about my inevitable weight gain. 😀 Yum! I can’t wait!